If you have been using your iPhone for a long time, your device contact list can become cluttered with duplicated contacts. It can be annoying when you need to find a certain contact and then you find yourself having to go through multiple entries that belong to the same people. The best solution to this problem is to either delete the duplicate contacts if they have no useful information or if they have useful information, you should consider merging them into one master contact that contains all the details in it. 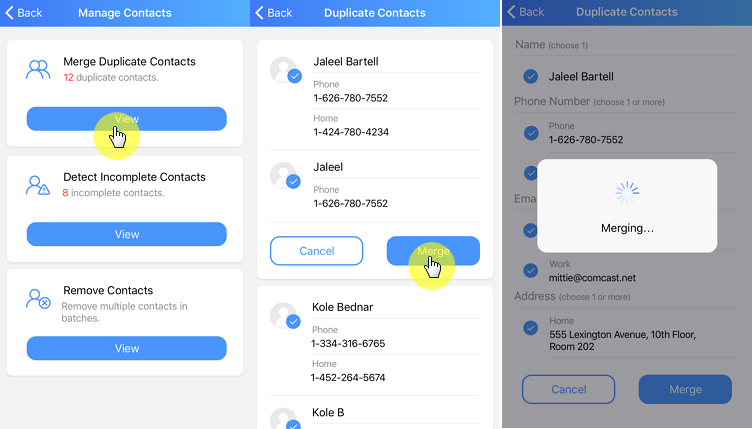 Any solution you choose should work perfectly and help you clear the mess that duplicate contacts create in your contact list. 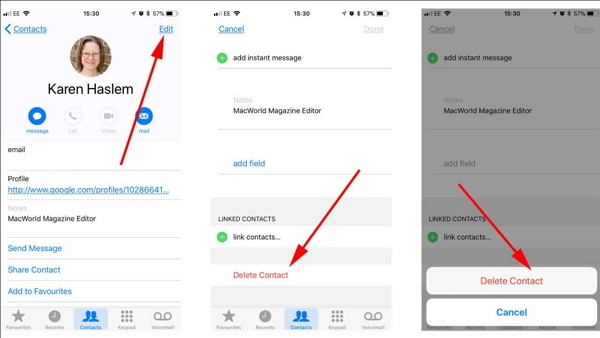 In this article, we will show you how to clean up duplicate contacts on iPhone. We will also show you how to merge duplicate contacts on iPhone. Step #1: In your iPhone Home Screen, click the Phone icon. Step #2: At the bottom of the screen tap Contacts. Step #3: Scroll through your contact list until you locate the duplicated contact that you would like to merge. Click the contact. Step #4: On the contact-screen top-right corner, tap on Edit. Scroll down the page to the bottom where you will find the link contacts… option. Tap on it. Step #5: After tapping the link contacts… option, you will be taken to your contact list. Now locate the contact you wish to merge with the current contact you are editing. Step #6: After locating the contact, click it to open it. Click the Link option available on the top-right corner and then tap Done to complete the merging. Step #1: Tap the Phone icon. This should be available on your Home screen. Step #2: Tap Contacts at the bottom of the page and then locate the duplicate contact you wish to delete. Tap on the contact. Step #3: Click Edit on the top-right corner of the screen. Step #4: Scroll down the page to locate Delete Contact. Tap on it. Step #5: Tap on Delete Contact in the dialog box that appears to confirm you want to remove the contact. 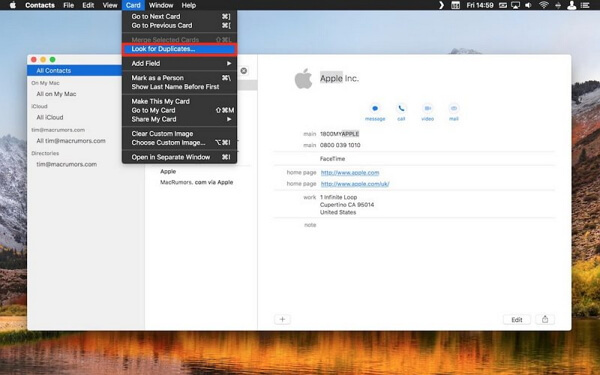 Step #1: Launch the Mac Contact app. You will find this in Applications. Step #2: On the left pane, select All Contacts if it is not selected. Step #4: You should see a drop-down dialog that tells you the number of duplicate contacts you have. It should also tell you whether the duplicates have the same information but different names or same name but different information. Tap the merge button to merge these contacts. As long as your Mac and iPhone are syncing using the same iCloud account, the changes should be reflected on your iPhone. Step #1: Using a computer web browser, log into your iCloud account using the same Apple ID and password you used to sign your iPhone into iCloud. Step #2: Tap the Contacts icon. Step #3: On the top-left corner, select All Contacts. This should allow you to see all the contacts you have in iCloud. Step #4: If you are using a Windows PC, hold the Control (ctrl) button down. If you are on a Mac, hold the Command button down. While holding either button down, click on the duplicate contacts you wish to delete. Release the Command/Control button after selecting all the duplicate contacts. Step #5: Click the Settings icon present at the bottom-left corner. Choose Delete from the menu that appears. Confirm you wish to clean up the Contacts by tapping on Delete in the Confirmation box that appears. 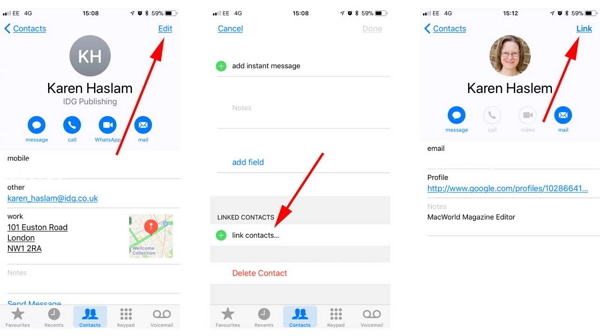 How to Easily Merge/Delete Duplicate Contacts on iPhone Using Free iOS Apps? 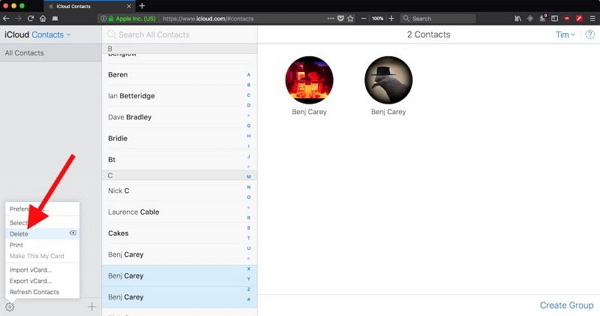 Step #1: After installing and launching the app, Click on Manage Contacts. Step #2: Allow iMyFone to access your Contacts by clicking OK on the dialog box that appears. Step #3: On the next Screen, tap View under Merge Duplicate Contacts. Step #4: Select the Duplicate contacts and then tap the Merge button. Step #5: Wait as iMyFone merges the duplicate contacts. You should see a Merge Completed notification when the merge is complete. Instead of allowing the duplicate contacts to mess your contact list, you can follow the simple steps outlined in this article to either merge or delete these contacts. The first methods will involve a lot of work. This will waste your precious time. However, when you use iMyFone iOS app which is 100% FREE, you will get to merge all your duplicate contacts in seconds.